Most average voters are unaware of this, but in Ohio’s primary on March 15th, we won’t just be nominating candidates for the GOP ticket in November’s races. 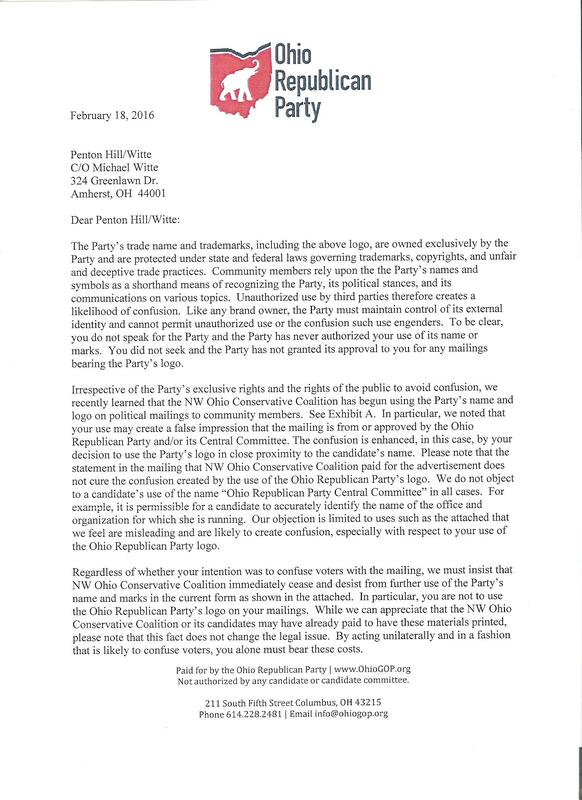 We’ll also be choosing who makes up the State Central Committee for the Ohio Republican Party. There is a man and a woman elected in each of Ohio’s Senate districts, for a total of 66 members. The ORP committee routinely votes every year to endorse themselves (all the incumbent members) and uses party money to promote keeping themselves in their current seats, instead of using donor money to defeat Democrats. However, we have covered past instances of the party using dirty tricks to avoid endorsing and supporting certain members that they don’t like. Weeks ago, we showed you how they filed a bogus challenge against one member, so that they had an excuse not to endorse and support him. Even after their bogus complaint was dismissed by the local board of elections, ORP refused to support him like they do for all the other incumbent members. Here in my district, there are challengers to the incumbent State Central Committee members for the 13th district. 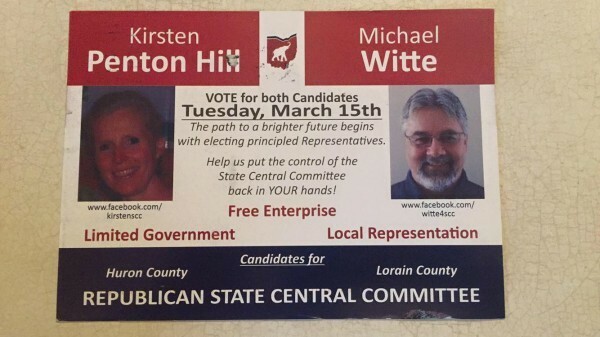 Mr. Michael Witte and Ms. Kirsten Penton Hill are campaigning together and sent out postcards to the GOP voters in the district. Below is one of their postcards. Normally, voters only receive mailers from the ORP endorsing the incumbent members, so it’s clear that these two candidates are determined and working hard to earn votes. 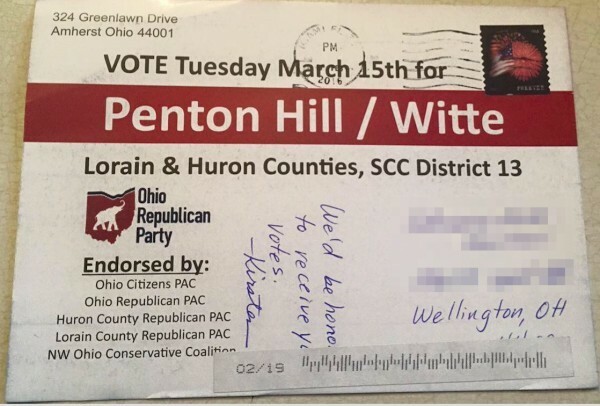 Not long after these cards went out, however, Mr. Witte says that he received a threatening letter from Chairman Matt Borges over the use of the ORP logo. They are running for a position in the Ohio Republican Party, after all. And the cards do not claim that they are endorsed. I asked Witte about the mailers and the letter from Borges. Here was his response. We had the cards printed prior to the week of 2/14 and they were mailed on Tuesday Feb 16. 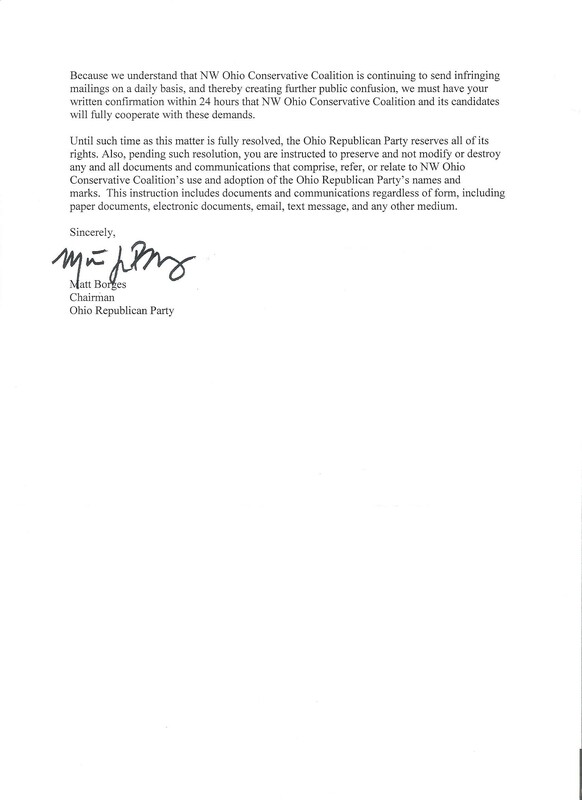 When formulating the layout, we considered using the Ohio Republican Party Logo, as we are Republicans, in Ohio, running for a position on the Ohio Republican Party State Central Committee. We discussed this with others who are also running, and the consensus was that there was nothing prohibiting it, so we included the Logo on our mailer. On Friday, Feb 19, I received a letter from Matt Borges dated Feb 18, stating the use was an unauthorized use of their (The ORP) trademarked logo. This was disturbing to me, as I was under the impression that there was no trademark. So I researched it, and found that the Logo in question is not registered on the USPTO (United States Patent and Trademark Office) database. Searching the Ohio SOS site, I found that the subject Logo was registered as of Wednesday, February 17, 2016. Here is the letter he received from Borges. Indeed, Witte is correct in his assertion that at the time he sent his post cards, the logo was not registered. The ORP only rushed out and registered the logo after the fact, and then sent out the letter. The registrations with the Secretary of State’s office, on 2/17/16, can be viewed here and here. Borges’s letter also contains mistakes. 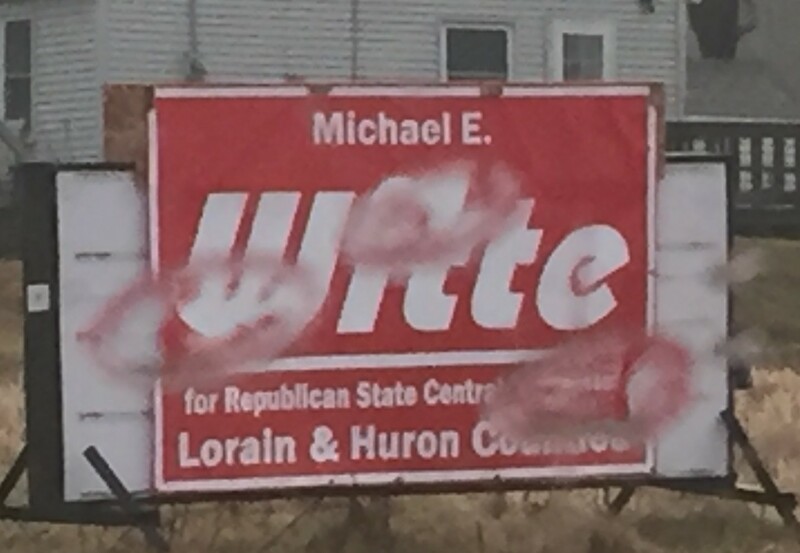 He accuses Witte of representing the NW Ohio Conservative Coalition. But Witte says he is not associated with them in any way. Lorain County isn’t even located in NW Ohio. Borges also refers in the letter to an included exhibit, but none was included. All that being said, I can understand the ORP’s desire to control their own brand and intellectual property. But since they hadn’t registered the logos, it appears they were quite sloppy in doing so. For his part, Mr. Witte says that now that the logo is registered to the ORP, he will no longer use it. I can only laugh about this, because it reminds of the old adage, “Turnabout is fair play”. Years ago, when the ORP sent out mailers to promote their incumbent members, they emblazoned the postcards with a logo that proclaimed “Tea Party Values”. One last note about Mr. Witte’s race. He is challenging incumbent member Matt Cox. Cox was recently featured in the blog RedState for being a big donor to Democrats, including Sherrod Brown, Chris Redfern and John P. Carney, among others. Some of the names many not be familiar, but John Carney was running to unseat Republican Dave Yost who is the Ohio Auditor of State. Chris Redfern is the former Chairman of the Ohio Democratic Party and a former member of the Ohio House of Representatives. Sherrod Brown is a left wing Democrat who defeated Josh Mandel (currently the Ohio State Treasurer) in 2012 in his re-election fight. It doesn’t make much sense his PAC gave money to candidates looking to defeat Republicans. Cox was appointed to his current seat on the SCC on the recommendation of Chairman Borges, after Bob Rousseau passed away while occupying the position. Yes, you heard that right. Borges recommended and placed on the Republican SCC a person who donated major funds to defeat the same Republicans that the ORP was trying to elect or reelect. I can tell you one thing. I have never seen such an effort in a SCC race. 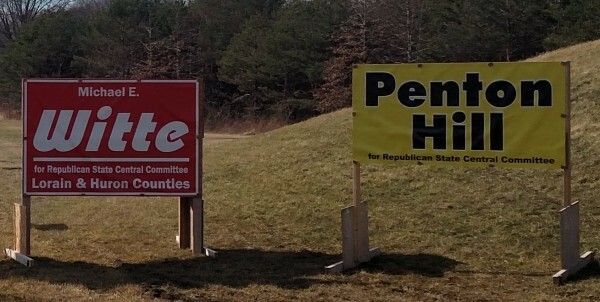 Witte and Penton Hill have blanketed the district with signs, which is pretty unheard of in these types of races. (Apologies for the poor picture, it was obviously raining!) The handwritten note on their postcard was also a nice touch. They are working hard. There is also a second challenger in the race, but I have yet to see any campaigning from that party. Whether Cox continues to hold his seat or he is replaced will be up to the GOP voters of Lorain and Huron Counties on March 15th.